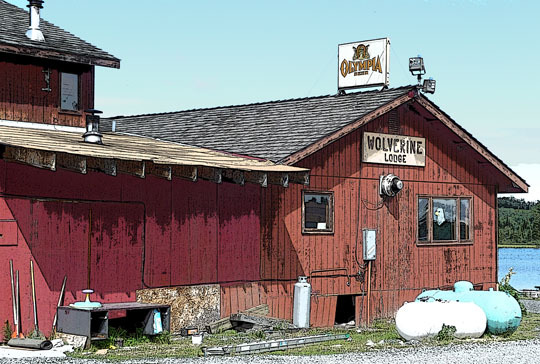 Summer picture of the old Wolverine Lodge. Sunday, December 31, 1979—it’s -30° this morning, stayed cold all day. Worked on the sled for log hauling (re-built the hitch, this time). Hauling logs in the tundra and deep snow is really hard on the sled. It was -40° at 6:00 p.m. Went to Lake Louise to a party at Wolverine Lodge. The whole neighborhood is leaving in one group tonight. We hung around Wolverine Lodge for a while. It was -47° at 11:40 p.m. when we headed for Glennallen about 36 miles away. We saw small herds of caribou both coming and going. About half way down the Lake Louise Road towards the Glenn Highway, it was midnight and we all stopped our cars, got out, and wished each other Happy New Year. Then we went on to Glennallen to a roadhouse party and danced until 3:00 a.m. Then Dan Billman and Chris Ronning and I ran a hundred yard foot race in the parking lot. It was so cold that we didn’t dare breathe—we ran the hundred yards without taking a breath. (You don’t want to breathe under those circumstances when you are exerting yourself like that for fear of frosting your lungs.) We went back in the lodge and talked the cook into making breakfast for us. After breakfast, we went back to Nelchina. Chris Ronning came to the cabin about 5:00 a.m. the next morning. It was still -40° then. This entry was posted in Journal Entry and tagged 47 below, Glennallen, hundred yard foot race, New Years Eve 1979, Wolverine Lodge. Bookmark the permalink.